So at the end of that bitter struggle, you ended up with the final Nintendo DSi XL. Can you tell me how you decided on the three different colour schemes? Usually, whenever we’re deciding on the colour of handheld consoles, we come up with a lot of differently-coloured models. But this time around, because the pace of development was so rapid, we got the modeller to come up with twenty sample models. We were really at a loss as to which colour to go for, but we decided on the twenty colours and presented them. 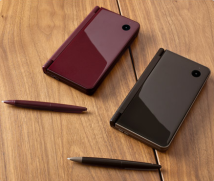 We were told to readjust the colours and what we finally proposed was natural white and dark brown.5 5Please note that in Europe, the Nintendo DSi XL colours available are wine red and dark brown. At first the plan was to go ahead with just these two colours, wasn’t it? That’s because we were told that we could only mass-produce the console in two colours. Then the sales department strongly urged us to make it in three colours. Right. So we decided to add wine red to the colours. Thinking about it now, I’m glad that we made it in three colours. It’s good that you made all that effort and came up with three colours. The appearance when you line them all up together changed a great deal. Right. We decided upon natural white and dark brown very easily but we fretted a lot over which shade of wine red to use. We finally settled on the colour you see today after gathering opinions from colleagues. If you speak to large-scale retailers, they’ll tell you that it’s not just older customers who are going for the wine red version but that younger women are also purchasing it. I was a little surprised by that as I had assumed that younger women would go for natural white. I think that wine red will actually prove a popular colour. That’s right. But because we made it two-tone, the volume of work was doubled which was really exhausting. 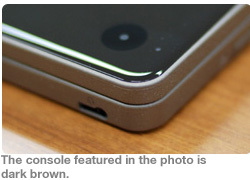 Why did you decide to make the colours two-tone for this console? I had wanted to give two-tone colours a try for the DS Lite and Nintendo DSi but because the hinges are quite complicated, it meant that it didn’t work very well. But this time you were given full responsibility for coming up with the console's design so did you think that this time you definitely wanted to go with the two-tone colour scheme? It seems that there are a lot of customers who feel the same. But as a designer, I wasn’t convinced by that. You didn’t originally settle on those colour schemes in order to target older customers. The aim was that people would want to leave the Nintendo DSi XL in the living room or lying on the dining room table. We also made it so that the hinges stop the screen in two separate positions so that people could play with the console resting on the table-top. So if you open the top screen, it stops in two positions. Most mobile phones only stop in one position, don’t they? Right. As mobile phones are products that you open and close a lot, factors like durability have to be considered and normally they are made so that they only stop in one position. But with the Nintendo DSi XL, the LCD screen has become bigger and the angle of vision has been increased so we wanted it to also stop at 120 degrees. Furthermore, we’ve also made it so that the sound can be heard more clearly. I've heard customers who’ve actually bought the console commenting on the fact that the sound is much improved. What sort of ideas did you come up with to achieve this? There was just one small hole on the left and right. That’s right. But this time round, after consulting with Fujino-san, we made it so that there were seven small holes on each side. A very important aspect of this product was that it should be easy to understand so I wanted to make it so that you are able to tell right away that these are the speakers. In addition, because the screens are much bigger, we naturally wanted to also increase the volume for the audio. But since the speakers are the same ones that we've used up to now, we pondered how to make the sound louder. Then after a process of trial and error, we made it so that it sounds louder. So even though the speakers are the same, the speaker enclosure6 has a greater capacity so we’ve been able to make it sound louder. 6Speaker enclosures are the boxes that contain the speakers. By replaying low sounds, the audio quality is improved. I played Daigasso! Band Brothers DX7 for the first time in a long time the other day and I did feel strangely happy. (laughs) 7Daigasso! Band Brothers DX was a DJ-style music game released for Nintendo DS in Japan in June 2008. One other thing I was happy about was the larger stylus that comes with the Nintendo DSi XL. I think that this is going to prove something of a sleeper hit. And reading the comments of customers on Club Nintendo, the feedback is indeed positive. That stylus was actually made in secret. So you made it without anyone asking you to do it? That’s right. I thought that it was sure to prove necessary, so I made it while keeping it secret the whole time. But as there had been no decision on what size it should be, I did fret over how big to make it. As this isn‘t something that slots into the console’s body, you were free to make it as big as you wanted to. Right. But it was actually harder precisely because I had too much freedom. I was asking myself how thick I should make it and how long I should make it. Well, Nintendo isn’t a company that designs pens, is it? (laughs) That’s why I went to a lot of stationery shops at the time. Yes, they do. 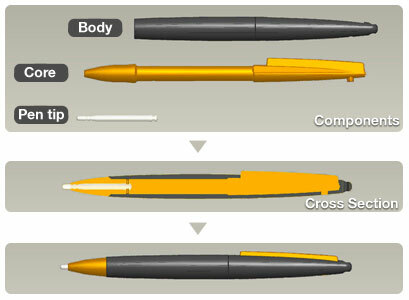 I finally came up with the design for the stylus after using a lot of different pens for reference. It’s always difficult to make something thick out of plastic. 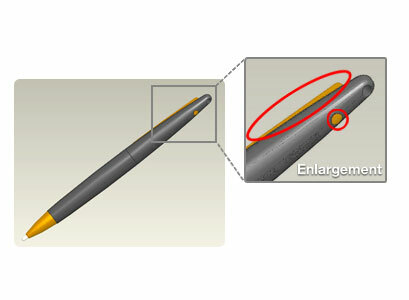 With this stylus, you need to cover the core with the body, and then there’s also the tip. So you make it by combining three separate components. I was also able to give the stylus a two-tone colour scheme to match the main console. 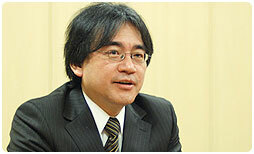 Also, when I made the presentation about it to you, Iwata-san, you made the request that I should ensure that the stylus doesn’t roll. Well, since we’re saying to people that we'd like them to play on the table-top, it would be really annoying if the specially-designed stylus was to roll across the table. I thought that you were exactly right and when I spoke to the company that were manufacturing the stylus, I realised that it couldn’t be moulded without having two parts of the core protruding from the body. So I decided to make one of these parts into something like the clip of a pen. By doing that, I was able to follow through with your request and make it look like a pen. But just when I was feeling pleased with myself, people got angry at me again. People got angry at you? Well, because it looked like a pen, people were asking why it couldn't actually clip into your pocket. That's when I had to make clear that it wasn't actually supposed to be a pen.